Thanks to a document that I'm writing for FES-Ildis of Bolivia, I present one of the hardest tables to construct in my country (at least in 2011), inthis table I present how upstream gross revenues are divided in Bolivia after the "nationalization" process. The reader will note that this post contains very little text, since the importat fact is the attached table. I just want to note what I mentioned in the past, if tax revenues are now increasing is mainly because the size of the "cake" (upstream gross revenue) is larger, for example, in 2000 the "cake" was close to US$ 500 million, by 2011 is almost US$ 4,000 million, this increase was because the natural gas export project from Bolivia to Brazil agreed in the 90's. and also because the remarkable growth in international oil prices. Well... this table speaks for itself (all figures are expressed in millions of US dollars), of course if you want to know the methodology, I invite you to review the full document doing click here. In 2007 I published a book (The Nationalization of the New Millennium: when the price was an ally) where, in one of the concluding paragraphs, I noted the following: "The average state participation in upstream gross revenues... will oscillate between 51% and 70%" . 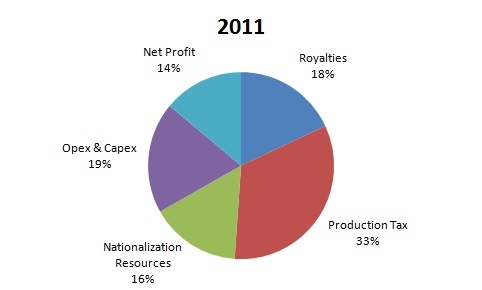 It is gratifying to see that, for example, in 2011 this proportion was 67% (divide Royalties + HR + Nationalization between total gross income in the table).